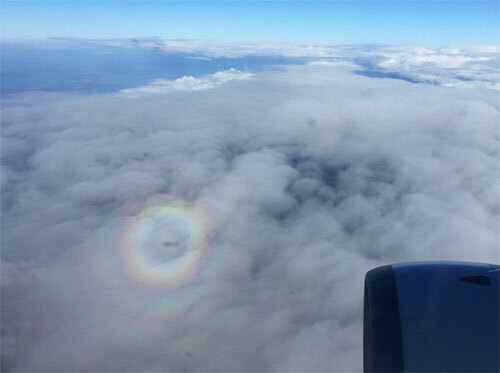 What you see is like a small circular “rainbow” with the shadow of my airplane in the midde. A so called “glory”. This first thing is something called a “glory” I learned from Twitter today. It is an optical phenomenon that well, I could not fully understand even after reading the Wiki-page about it. I have been on hundreds of flights and never seen this before so I was excited! This phenomenon you probably have seen before. It went on for about two full minutes which was quite unusual I think. On my other flight between Paris and San Francisco we had this “wingnado” going on for two full minutes. This aerodynamic column of air is quite common in humid areas during takeoff and landing, as fas as I have seen. Common or not, it is a really cool phenomenon and it does look like a tornado so it made my day together with the Glory.